The digital elevation model documented here provides a tool for calibrating tsunami models to effects of the 1945 Makran tsunami that were observed in Karachi Harbour. The DEM bathymetry is derived from soundings made mainly during the first 8 years post-tsunami. While deficient in its portrayal of interior tidelands and upland topography, the DEM accurately represents the setting of a tide gauge that recorded the 1945 tsunami. Simulations of historical tsunamis can be improved by using archival bathymetry, shorelines, and topography. Examples include the use of historical nautical charts in making a digital elevation model (DEM) for computer modeling of the 1960 Chilean tsunami in Hawaii (Tang et al. 2006). DEMs are commonly developed to support tsunami modeling (Eakins and Taylor 2010). This paper derives a preliminary DEM for simulating the 1945 Makran tsunami in Karachi Harbour (Fig. 1). Nautical charts and topographic maps from the middle of the twentieth century allow the DEM to approximate physiography that the 1945 tsunami encountered. The intended application is computer simulation of the tsunami’s effects, which have been compiled elsewhere from a tide-gauge record, newspaper accounts, and testimony of elderly residents. We call the DEM preliminary because of several limitations, particularly in representing interior tidal flats, mangroves, and uplands. A data file of the gridded DEM is presented in Hasan et al. (2018). 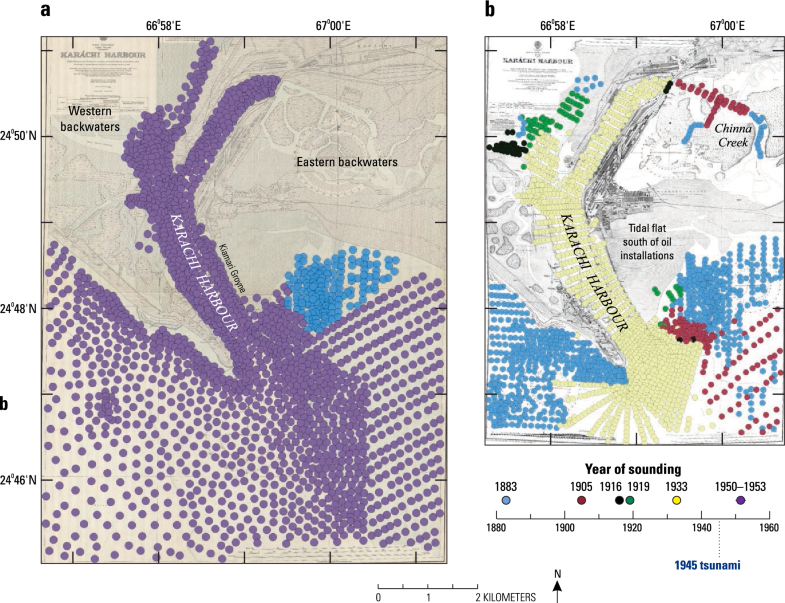 The paper is illustrated by maps of the soundings used and considered (Fig. 2), a graph of vertical datums (Fig. 3), a map showing where data were interpolated separately (Fig. 4), a simplified color version of the DEM (Fig. 5), and details in the vicinity of the Karachi tide gauge (Fig. 6). Electronic supplements provide scans of the main nautical chart and topographic map used (Additional file 1: Figures S1 and S2), tabulate digitized soundings that were used in the DEM (Additional file 2: Table S1), and list additional soundings considered (Additional file 2: Table S2). Control points used in georeferencing the historical maps can be found in the Appendix (Table 1) and on a supplementary map (Additional file 1: Figure S3). The supplements also include a map comparison between the preliminary DEM and archival bathymetric contours (Additional file 1: Figure S4). At the time of the 1945 tsunami, Karachi was a commercial center, a provincial capital, and a port city. The urban population, in a 1941 census, had recently passed 400,000 (Lambrick 1942, p. 16, 22). The port, from wartime expansion, had been handling record tonnage (Brow 1947). The tsunami’s effects in Karachi Harbour are evidenced by a tide-gauge record, newspaper accounts, and eyewitness testimony. The Karachi tidal observatory is one of the two—the other being in Bombay (Mumbai)—where the 1945 tsunami was recorded instrumentally (Neetu et al. 2011). Period maps locate the Karachi observatory inside the lower harbour at Manora, on a pier at 24.804°N, 66.970°E (Figs. 1b, 5, and 6). The full Karachi marigram is presented and detided in companion paper (Adams et al. 2018). The tsunami made the front pages of two Karachi newspapers, the Daily Gazette and the Sind Observer. Both papers told of a “tidal wave” that had flooded oil installations and damaged Kiamari Groyne, a rock wall along the harbour’s east side (locations, Fig. 1b). A wire-service story in the Times of India, published in Bombay, gave times of four waves, the highest of which reportedly followed the predicted high tide by “about 100 min.” A description in Pendse (1946, 1948) resembles the Times account. None of these 1940s reports identify the observers. Tsunami effects at Karachi were later summarized by Ambraseys and Melville (1982) and Hoffmann et al. (2013). In addition, elderly residents of port villages recently testified to flooding at Baba Island and Bhit Island, and to currents in nearby Baba Channel. Some of this testimony appears in Kakar et al. (2015). Except in a recent conference paper (Hasan et al. 2017), simulations of the 1945 Makran tsunami have not been extended into Karachi Harbour. Modeled wave trains have instead been evaluated at synthetic tide gauges outside the harbour, in the Arabian Sea. One of these synthetic gauges was positioned 40 km southwest of the harbour, at 24.46°N, 66.80°E (Rajendran et al. 2008, p. 1742). Two others are closer (Fig. 5), at 24.767°N, 66.985°E (Heidarzadeh and Satake 2015, p. 626) and 24.78°N, 66.98°E (Rastgoftar and Soltanpour 2016). Tsunami modelers have obtained bathymetry outside the harbour from ETOPO (Neetu et al. 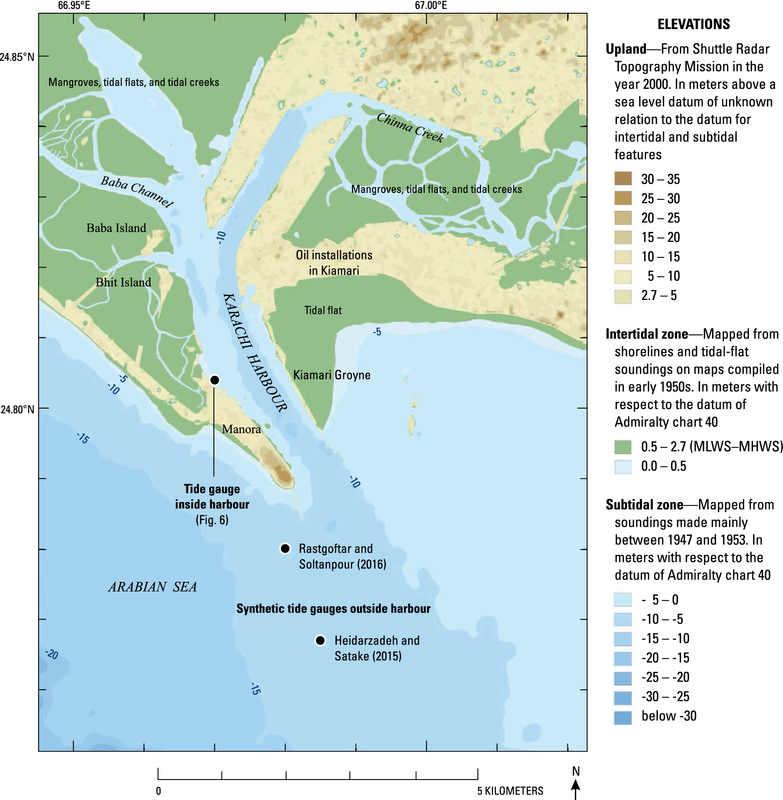 2011) and from the General Bathymetric Chart of the Oceans (GEBCO) (Rajendran et al. 2008; Heidarzadeh and Satake 2015; Rastgoftar and Soltanpour 2016). For the conference paper (Hasan et al. 2017), bathymetry inside the harbour was extracted from the 1939 edition of the nautical chart discussed below. Most of the bathymetry in the DEM is derived from the 1955 edition of British Admiralty chart 40 (BA 40). We obtained scans of editions printed between 1884 and 1955, from the Geography and Maps Division of the Library of Congress, Washington, D.C. The 1884 edition uses harbour soundings made in 1883. Later editions credit surveys that were made in or before 1889, 1905, 1916, 1919, 1933, and 1953, primarily inside the harbour (Fig. 2). Minor revisions were made in intervening years. At first, we thought to make a tsunami-era DEM from soundings on the 1939 edition of BA 40. We found, however, that the 1939 chart contains a mosaic of soundings from various times back to 1883 (Fig. 2b; Additional file 2: Table S2)—in contrast to the 1955 edition, which uses soundings that are more nearly synoptic. Most of the DEM bathymetry is, therefore, derived from this 1955 edition of BA 40, which is reproduced in Additional file 1: Figure S1. Its headnote cites “surveys by the Pakistan Government and Karáchi Harbour authorities to 1953.” Also included in this edition are water depths in a distinct font that are credited to soundings from the nineteenth century. The publication scale is 1:12,000. Nearly all the soundings on the 1955 chart were made in the first 8 years after the 1945 tsunami, probably between 1950 and 1953. Few of the soundings on the 1955 chart appear in a BA 40 version updated to 1950, and a headnote on the 1955 chart credits no source later than 1953. Surveys by the Pakistan Government should postdate August 1947, when Pakistan became independent. The only pre-tsunami soundings in the 1955 edition are in shallow-water areas south of Kiamari (Fig. 2b). These earlier soundings were made in 1883, as judged from the notes on the 1884 edition of BA 40. The 1955 edition also presents, in this area, a low-water line that is inherited from the 1884 edition. Additional lines of high water and low water, similar overall to those on BA 40, serve as tidal shorelines on 1944 and 1951 editions of a topographic sheet called the “Karāchi Guide Map.” This topographic map was published at 1:21,120 scale by the Survey of India (in 1944) and the Survey of Pakistan (in 1951). The Survey of India also published 1:63,360-scale topographic maps of the Karachi area on so-called “One-inch sheets” (one inch = one mile), which are excerpted as the base map for Fig. 1b. Both editions of the Karachi Guide Map provide topographic contours at 20-foot intervals, with a supplementary 10-foot contour in shoreline areas that were undeveloped in the middle of the twentieth century. The vertical datum was probably mean sea level, as discussed below. The DEM incorporates shorelines from the 1951 Guide Map. We used a scan that was provided by the National Library of Australia, and which is reproduced as Additional file 1: Figure S2. The 1951 edition covers nearly twice the area of the 1944 edition, by extending westward from Karachi Harbour into mudflats and mangroves. 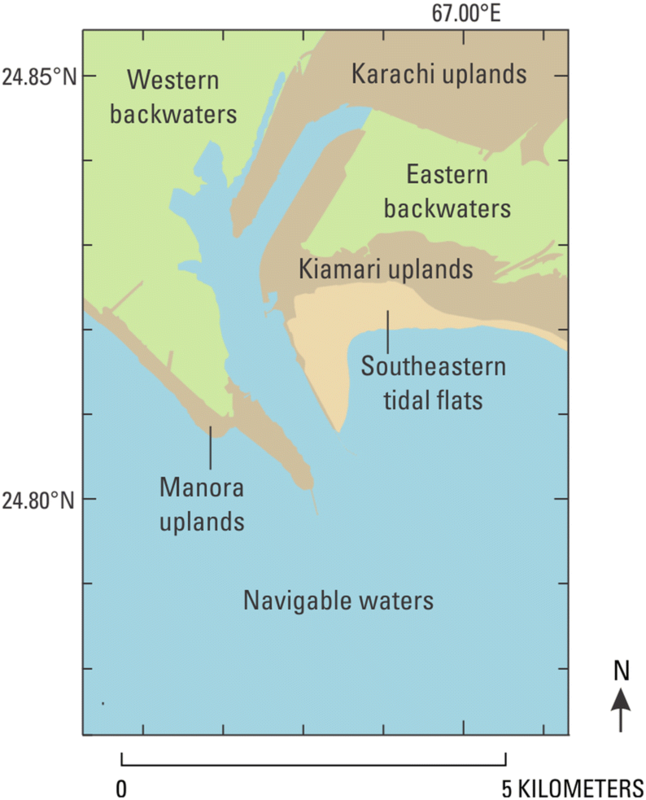 These intertidal features are built into the DEM, as partial coverage of the “western backwaters” in Fig. 1b. The DEM also uses, from the 1951 edition, high-water and low-water lines outside the harbour near Manora and Kiamari, particularly to supersede the nineteenth century low-water line on BA 40 south of Kiamari. To flesh out the DEM with upland topography, we used gridded data of the Shuttle Radar Topography Mission. The SRTM points, from the year 2000, have a horizontal spacing of 1 arc-second, or about 30 m. The elevations are referenced to a globally modeled mean sea level. This upland topography is not intended for use in modeling the 1945 tsunami, for two main reasons. First, the Karachi landscape was reshaped by urbanization between 1945 and 2000 (Inskeep 2011). Second, the Karachi topography resolved by SRTM is unlikely to affect simulations of the 1945 tsunami, which in Karachi Harbour crested no more than about 1 m above the level of the highest astronomical tides. This limiting height, consistent with the tide-gauge record and with eyewitness accounts of flooding on Bhit Island, is derived primarily from newspaper accounts of localized flooding of oil installations at Kiamari. To reach the oil installations, the tsunami overtopped a seawall that separated them from the tidal flat to the south. Relative heights plotted on the 1951 Guide Map suggest that this seawall stood 3–4 ft above the adjacent high-water line (“3r” and “4r” in Additional file 1: Figure S2). We identified reference points on BA 40 and the Guide Map that can still be seen in modern imagery on Google Earth (Table 1; Additional file 1: Figure S3). These persistent points were then assigned latitudes and longitudes referenced to the World Geodetic System of 1984 (WGS84). The DEM refers water depths and land heights to the chart datum of BA 40. According to editions of BA 40 printed between 1906 and 1948, and the 1955 edition as well, the chart datum was 14.14 ft (4.31 m) below a benchmark near the Karachi tidal observatory. This tidal benchmark is plotted on BA 40 and on the Guide Map. Chart datum served as the zero for the Karachi tide gauge in 1937–1948 (Permanent Service for Mean Sea Level 2016), and as the zero for Karachi predictions in the Admiralty tide tables for 1945 (Hydrographic Department 1944). The tide tables for 1945 are referenced to “the datum of the largest scale Admiralty chart of the place.” BA 40 was then the largest scale Admiralty chart for Karachi Harbour. 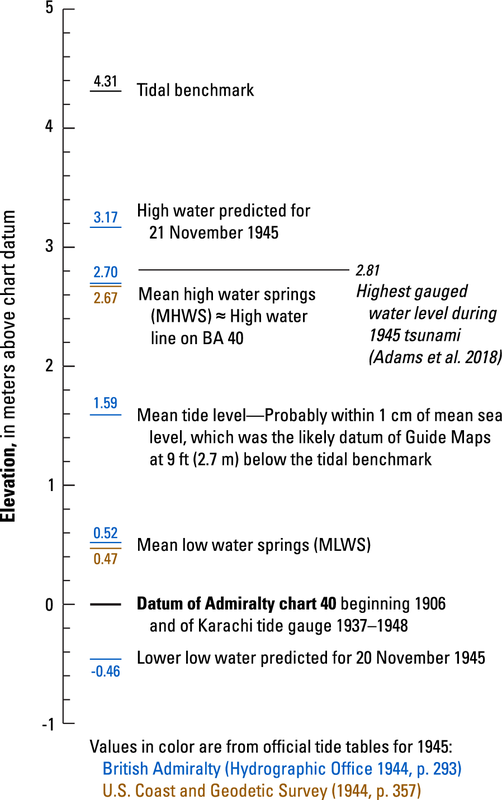 Karachi tidal datums are related to this chart datum in notes that accompany tide tables by the British Admiralty (Hydrographic Department 1944, p. 293) and the U.S. Coast and Geodetic Survey (1944, p. 357). The values are nearly identical, differing by a few centimeters (Fig. 3). In the Admiralty entries, the zero of the tide predictions (elsewhere equated with the BA 40 chart datum) was 1.70 ft (0.52 m) below mean low-water springs, 5.21 ft (1.59 m) below mean tide level, and 8.85 ft (2.70 m) below mean high water springs (MHWS). Mean low water springs (MLWS) denotes the average of the lowest low water attained once monthly, during the new or full moon (Pugh and Woodworth 2014). MHWS is the high-water counterpart. The high-water line on BA 40 approximates MHWS, at a level 2.7 m above chart datum. Tidal flat soundings below the high-water line on BA 40, 1939 edition, are no greater than 9 ft (2.74 m) above chart datum. MHWS is listed as 8¾ ft (2.67 m) on BA 40 editions printed between 1935 and 1950. Admiralty tide tables for 1945 give the similar figure of 8.85 ft (2.70 m). A higher average of spring high waters attained only near solstice, according to the 1955 edition BA 40, was 9.5 ft (2.9 m) above chart datum. The vertical datum for the Karachi Guide Map was probably mean sea level. This choice, though not spelled out on the map, is evidenced by the elevation given for the benchmark near the Karachi tidal observatory. In the 1951 edition (Additional file 1: Figure S2), and also in the 1944 edition, the Guide Map assigns this tidal benchmark an elevation of 9 ft (2.7 m), in contrast with the 14.14 ft (4.3 m) height of this bench mark above chart datum of BA 40. The difference of 1.6 m is indistinguishable from mean tide level, reported as 1.59 m above chart datum (Fig. 3). At Karachi, mean tide level is within 1 cm of mean sea level (Woodworth 2017, p. 74). The vertical datum for SRTM—the Earth Gravitational Model 1996, or EGM96—approximates mean sea level at any given place (Durland 2009). We do not know, for Karachi Harbour, how closely EGM96 approximates mean sea level, either today or in 1945. Mean sea level has probably risen about 20 cm at Karachi since the 1940s (Hogarth 2014, p. 7651). We did not attempt to include this rise when adjusting SRTM data to the datum for the DEM. 1955 BA 40—Soundings, low-water line, part of the high-water line, and most of the seaward edge mangroves. 1951 Guide Map—High-water and low-water lines outside the harbour, particularly south of Kiamari; and tidal creeks and mangroves of backwaters northwest and northeast of the harbour. Tidal-creek depths—Contours 1 m below chart datum were imposed inside tidal creeks of western and eastern backwaters (Fig. 4), so that their channels would appear in the DEM. The tsunami-era channel depths are unknown for the most part, but the 1 m depth assumed is consistent with pre-tsunami channel soundings along Chinna Creek (Fig. 2b). SRTM—Anachronistic upland elevations doubtfully related to the DEM datum and not intended for use in tsunami simulations, as discussed above. The compiled data were interpolated to convert a non-uniform distribution of points into a uniform grid. For this purpose, we divided the DEM area into seven parts—one area of navigable waters, including the densely sounded harbour; three areas dominated by tidal flats and mangroves; and three upland areas (Fig. 4). The interpolation, done separately within each of these seven areas, used a minimum curvature method in Surfer 15 (http://www.goldensoftware.com). Minimum curvature is a kind of spline interpolation that fits a surface exactly through data points (Smith and Wessel 1990). In a comparison of interpolation schemes for making bathymetric grids, Amante and Eakins (2016) found spline interpolation more accurate than inverse distance weighting and triangulation. We managed abrupt slopes and sharp curves by adding what Surfer calls a “faultline,” the points on one side of which cannot influence interpolation on the other side. Finally, the seven partial DEMs were merged and were resampled at 1 m using nearest neighbour interpolation. The resulting DEM is plotted as by ranges of historical water depth and modern land height in Fig. 5. The grid spacing of 1 m preserves details that may affect use of the DEM for tsunami simulation. These details include the tide-gauge location (Figs. 5 and 6) and a narrow sea wall (Kiamari Groyne, Fig. 1b). A much wider spacing would otherwise be warranted by the density of soundings in the navigable waters area. This area contains 1763 soundings in 58 km2, or an average of about 30 soundings per square kilometer, excluding the depths obtained from low-water lines, high-water lines, and mangrove margins. Randomly distributed data with an average density of 30 per square kilometer justifies a grid spacing of about 45 m (Eq. 13 of Hengl 2006). We tested the interpolation by making two comparisons between the DEM and the 1955 edition of BA 40. First, in the navigable waters area, we compared the 3 fathom (5.5 m) and 6 fathom (11.0 m) depth contours in the DEM with those same contours the nautical chart (Additional file 1: Figure S4). Second, we used the DEM to make a bathymetric profile that crosses the harbour through the site of the tide gauge, for comparison with nearest soundings on the 1955 chart (Fig. 6). Both comparisons show close agreement. The DEM excludes the extensive tidelands west and east of the harbour (backwaters, Fig. 1b). These chiefly intertidal areas may have large capacity for tsunami water. The DEM uses harbour soundings made mainly after the tsunami. If the 1945 tsunami modified the harbour bathymetry, the DEM may locally differ from the water depths that the tsunami encountered. 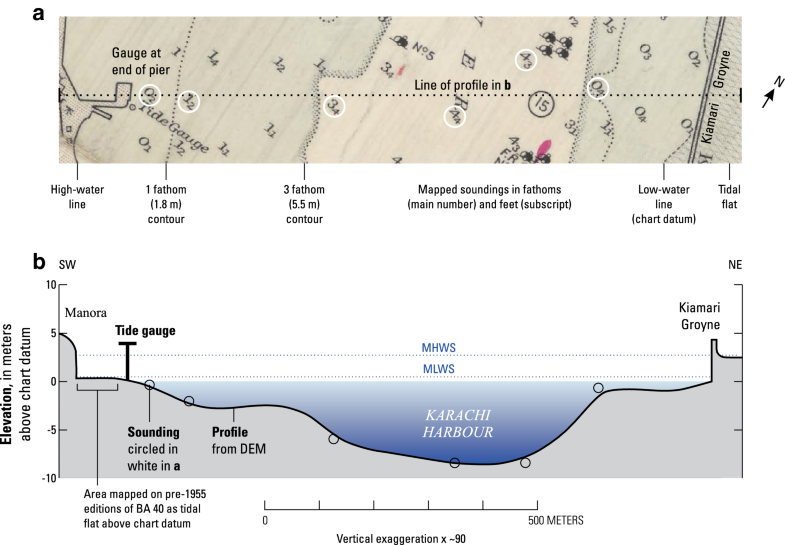 The DEM includes uses assumed channel depths and mangrove heights in the backwaters and relies on nineteenth century soundings on the tidal flat east of Kiamari Groyne (Fig. 2). The SRTM data used for upland topography, in addition to being anachronistic and insecurely related to the historical chart datum, include many small areas that spuriously plot below chart datum (Fig. 5). The interpolation methods warrant further assessment in the manner of Amante and Eakins (2016). 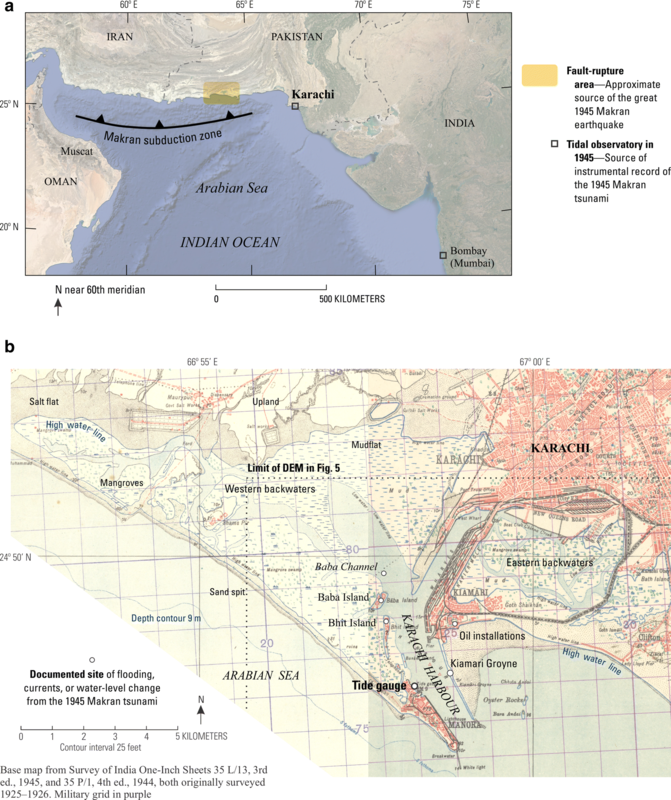 A DEM for Karachi Harbour facilitates simulation of the 1945 Makran tsunami in Karachi Harbour, an area where observations of this tsunami are uncommonly abundant and diverse. The DEM is based mainly on a nautical chart that was surveyed less than 8 years after the tsunami. Limitations of the DEM include its truncation of backwaters inland from the harbour. The Karachi tide gauge recorded the 1945 tsunami in shallow water behind a headland—a physiographic setting that the DEM represents. HH georeferenced the source maps, digitized soundings and shorelines, and developed the gridded DEMs. BFA obtained scans of archival nautical charts and topographic maps. All authors prepared the figures, and BFA contributed most of the text. All authors read and approved the final manuscript. Frank I. Gonzaléz, James Luke Blair, Keith Knudsen, and two anonymous referees improved this paper with their reviews. Included with this article, as additional files, are (1) the scanned maps on which the digital elevation models are based, and (2) the DEMs themselves, as tables of longitude, latitude, and a vertical parameter for water depth and land-surface elevation. The DEM data are available in Hasan et al. (2018). This work was initiated under a UNESCO project supported by the United Nations Economic and Social Commission for Asia and the Pacific. Additional support was provided by the U.S. Agency for International Development through its Office of Foreign Disaster Assistance and the U.S. Geological Survey. 40562_2018_117_MOESM1_ESM.pdf Additional file 1: Figure S1. Scan of the 1955 edition of Admiralty nautical chart (BA 40), “Karáchi Harbour”. Figure S2. Scan the 1951 edition of the Karachi Guide Map, published by Survey of Pakistan. Figure S3. Points used to georeference various editions of BA 40 and the Guide Maps (Table 1), plotted on a modern image from Google Earth. Figure S4. Shaded relief image of the DEM showing a comparison of 3 and 6 fathom contours digitized from BA 40 and extracted from the DEM. 40562_2018_117_MOESM2_ESM.xlsx Additional file 2: Table S1. Soundings digitized from the 1955 edition of Admiralty nautical chart (BA40), “Karáchi Harbour”. Table S2. Soundings digitized from the 1939 edition of Admiralty nautical chart (BA40), “Karáchi Harbour”.